Set in the 1970s, Cosi is the hilarious look at life through the eyes of patients in an insane asylum who mount a production of Mozart's Cosi Fan Tutte. Amidst laughter, tears and poignancy, the journey to opening night depicts the 'normality' of the insane, as Louis Nowra's brilliant play exposes the insanity of real life through the instituitionalised antics of the inhabitants of his world. 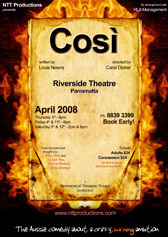 With the rage within and against the Vietnam War as a backdrop, Cosi is an unforgettable portayal of humanity.